Welcome to the Flycaptain Club! The best Flyboard club in France located in the south of France in Golfe-Juan, Cote d'Azur, between Cannes and Antibes. Club Flyboard, nautical base and leisure, dedicated to the activity flyboard (ESH) hydropropulsed lifting gear. Discover a Flyboard area specially designed and marked with accessories only available at the FlyCaptain Flyboard Club like FLYPAD, Takeoff and landing like Flyboard Air style! 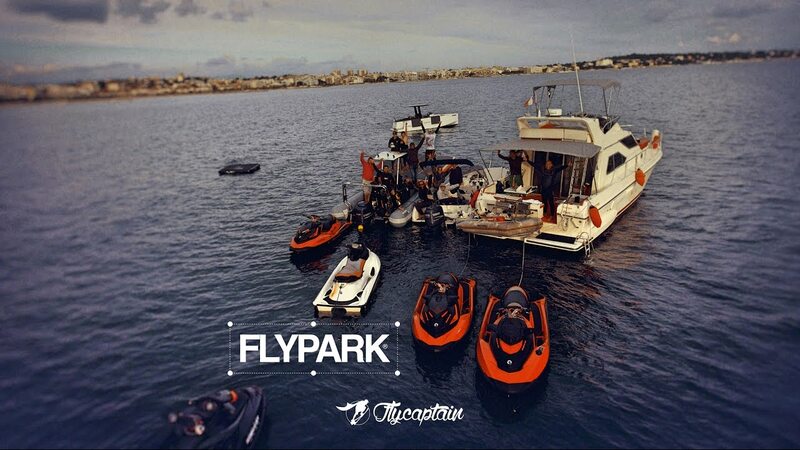 From the beginner to the professional, the FlyCaptain school is definitely the place for all fans of extreme sports, nautical and jetski on the French Riviera. Join the Flyboard Flycaptain club for an outing every Saturday at Port Camille Rayon from 10am to 4pm. Come with your equipment or rent it on site at discounted prices. Join a band of enthusiasts to spend time together and practice with the best Flyboard riders in the world! Flycaptain is proud to have 2 riders on the PRO team in France. Steve (Vice European Champion 2016 and Vice World Champion 2016) as well as Jeff Gazzola who finished 5th at the European Championship in Cavalaire and a beautiful place of 10th for his first World Cup in Naples in the USA. Steve and Jeff practice their regular training every Saturday at the Flycaptain club. A real show not to be missed! FRANKY ZAPATA is the inventor of the Hoverboard by ZR®, Flyboard®, JetPack by ZR® and owner of ZAPATA RACING® products factory based in France. A Flyboard is a type of water jetpack attached to a personal water craft (PWC) which supplies propulsion to drive the Flyboard through air and water to perform a sport known as flyboarding. A Flyboard rider stands on a board connected by a long hose to a watercraft. Water is forced under pressure to a pair of boots with jet nozzles underneath which provide thrust for the rider to fly up to 15 metres in the air or to dive headlong through the water. In May 2015 Zapata Racing introduce the Flyboard® Pro Series and revolutionize the Hydro Sports a futuristic design and new innovations, new tricks and possibilities, independent foot control. On April 30, 2016 Zapata-Racing and Franky Zapata set a new world record: the longest Flyboard Air flight (2,252 meters). Much more than an extreme sensation, a new sport has just been invented. Flyboard Legend, Flyboard Pro Series, Hoverboard by ZR, JetPack by Zapata-Racing are all available at the FlyCaptain Flyboard Club. Welcome to the Flyboard Family. The Flyboard competition: 4 world cups of Flyboard including 3 organized by Zapata-Racing and Xdubai as well as the last one in partnership with ProWatercross in Naples Florida in the USA in September 2016, and the first European Flyboard Cup at the beginning of June 2016 To Cavalaire in south of France, French Riviera (direction Saint-Tropez coming from Cannes Antibes). Join the Flycaptain Flyboard club to practice the Flyboard at high level and why not register for the next competitions. We are looking for riders in all categories, Women, Veterans (above 40 years) and Pro Rider. You are welcome to register your qualification video at the club. Every Saturday - (Except in bad weather) - Go to the slipway at Camille Rayon harbor in Golfe Juan. 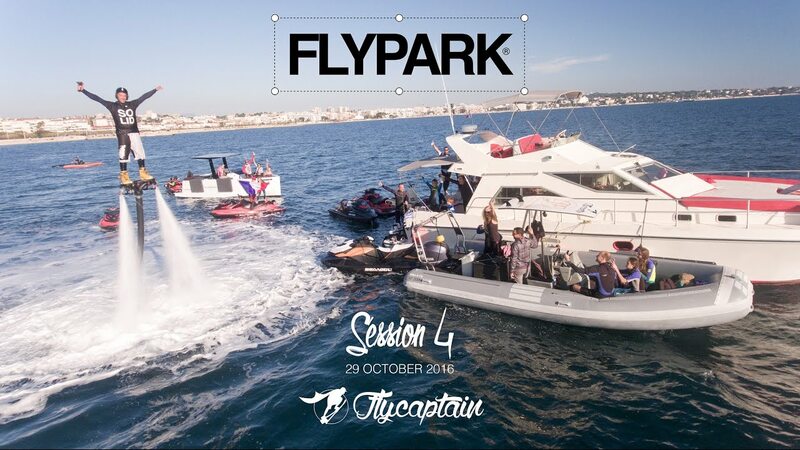 In case of bad weather, thank you to contact in the morning with the club flyboard FlyCaptain FlyPark: 0661223222 in order to obtain some instructions. LEAVE A MESSAGE if no answer. A member of the FlyCaptain team will get back in touch quickly and then confirm whether or not they can safely run the Flyboard, Hoverboard, JetPack Zapata-Racing club. The Flyboard Club is open every Saturday from 10am to 4pm. No Jet ski launch will be permitted after these times. French Riviera Water Toys, B19 Port Camille Rayon, Golfe-Juan, French Riviera, France. 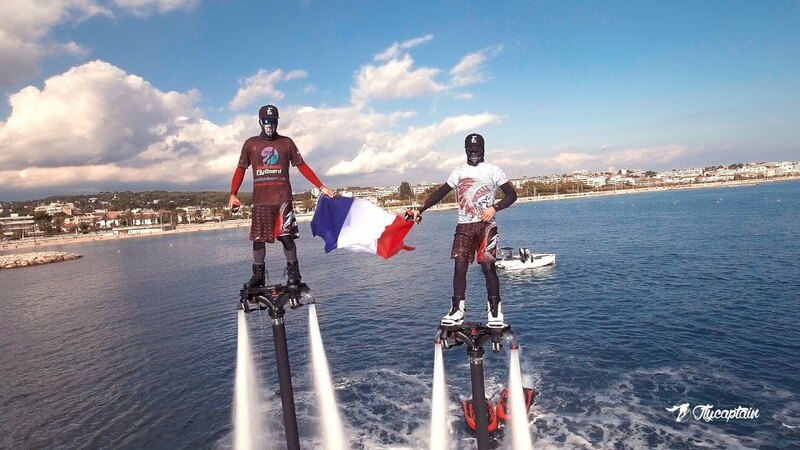 Flyboard Cannes, Flyboard Antibes.